Many moms warn their kids about touching sticky surfaces. UC San Diego Distinguished Professor of Chemistry & Biochemistry, and a mother herself, Vicki Grassian heeds not the warning—in the lab. As a scientist, one of the areas Grassian studies is how organic compounds from things like perfume, foodstuffs, fabrics and soaps coat indoor surfaces—windows, countertops, walls and floors. The filmy phenomenon found so commonly in our homes and workplaces can impact the air we breathe and the health we enjoy. Yet the details of how these compounds interact with indoor surfaces on the microscopic level are not fully understood. Using vibrational spectroscopy, atomistic computer simulations and kinetic modeling, Grassian and her co-workers applied more “elbow grease” to the interfacial science by experimenting with glass and limonene—the chemical that gives citrus fruit its scent, as in air fresheners, and makes it a solvent, as in household cleaners. The results of their research are published in the current issue of Chemical Science, the Royal Society of Chemistry’s (RSC) peer-reviewed flagship journal. Currently, according to Grassian, the air we breathe in indoor environments is poorly understood. It is known, however, that organic compounds in our homes and workplaces can stick and unstick from surfaces through adsorption and desorption. Adsorption is the process in which molecules from the air stick to a surface and desorption occurs when molecules on a surface go back into the air. 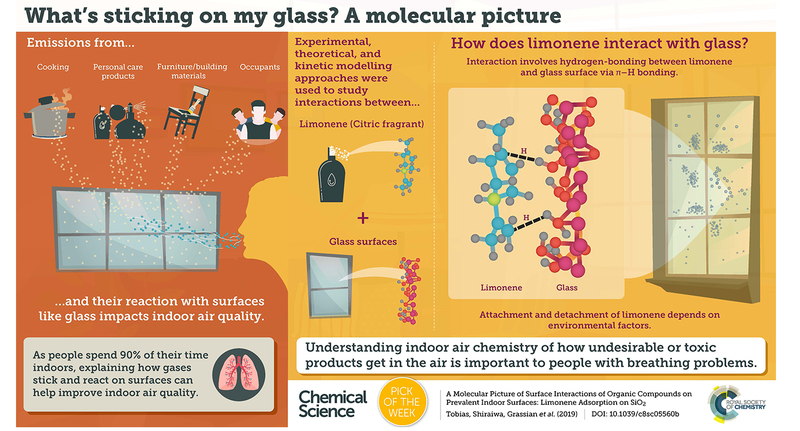 This integrated experimental, theoretical and kinetic modeling study constitutes a conceptual framework for understanding the interaction of organic compounds with indoor relevant surfaces, thus providing important insights into understanding indoor air chemistry and indoor air quality. The science team involves the experimental research group led by Grassian at UC San Diego and the theory and modeling groups of Professors Douglas Tobias and Manabu Shiraiwa, respectively, from UC Irvine. Students and postdoctoral associates involved in the research include Yuan Fang, Andrew McDonald and Mona Shrestha from UC San Diego, and Pascale Lackey and Saleh Riahi from UC Irvine. The cutting-edge research was highlighted as the RSC’s “ChemSci Pick of the Week.” The RSC is the world’s leading chemistry community, advancing excellence in the chemical sciences. With over 54,000 members and a knowledge business that spans the globe, it is the United Kingdom’s professional body for chemical scientists; a not-for-profit organization with over 175 years of history and an international vision for the future. It promotes, supports and celebrates chemistry, working to shape the future of the chemical sciences—for the benefit of science and humanity. This material is based on the work supported by the Alfred P. Sloan Foundation (grant numbers G-2017-9692, UC San Diego; G-2017-9796, UC Irvine). The contents of this study do not necessarily reflect the official views of the Alfred P. Sloan Foundation. The Alfred P. Sloan Foundation does not endorse the purchase of the commercial products used in this report.